Samford's football Bulldogs made history Nov. 23, winning a share of the Southern Conference football title with a dramatic, last-second 33-32 win over Elon University. The 18th-ranked Bulldogs will face former Ohio Valley Conference rival and 20th-ranked Jacksonville State University in the first round of the NCAA playoffs Nov. 30 at 7 p.m. in Jacksonville. The game will be televised on ESPN3, according to the NCAA. Tickets in the Samford sections are on sale through 5 p.m. Wednesday (Nov. 27) at www.samfordsports.com/tickets, or by calling the Samford ticket office, 205-726-DOGS. The Bulldogs finished the regular season with a record of 8-4 overall and 6-2 in league play. It is Samford's first-ever NCAA Division 1 football conference title, although the Bulldogs made the national playoffs in 1991 and 1992 as an independent. An overflow crowd of players, athletics staff and family members watched the nationally-televised playoff selection show Nov. 24 in Samford's Cooney Family Field House. The room began to buzz when Jacksonville State's name came up on the screen, and then erupted when Samford's name was called. "It's exciting," Samford head coach Pat Sullivan said. "To do it the way we've done it the last two weeks, winning on the last play of the game, is special. We have a great opponent in Jacksonville State. We have to go back to work and start getting ready for a big ballgame." The winner of the Samford-Jacksonville State game will play Dec. 7 at 6th-seeded McNeese State University in Lake Charles, La. Two other teams that Samford faced this season also made the playoffs -- Southern Conference rival and co-champion Furman University and Southeastern Louisiana University. Samford and Furman are the only SoCon teams to make the playoffs. Jacksonville State is one of three OVC teams in the bracket. SLU won the Southland Conference championship and is seeded 4th. "The Southern Conference football title is a great achievement for the team and for the entire university. It validates the decision we made six years ago to accept the invitation to join the SoCon, both from an athletics and an academic standpoint," said Samford President Andrew Westmoreland. "We are proud of our student-athletes, whose accomplishments in the classroom even exceed their athletics accomplishments." This will mark the 46th meeting between Samford and Jacksonville State, with JSU holding a slim 22-21-2 edge in the series. 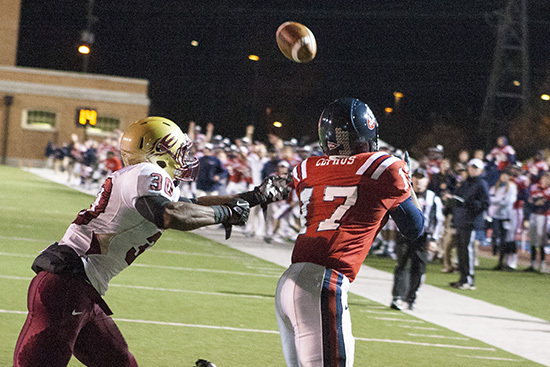 Jacksonville State is Samford's most-played opponent in the history of the football program.